On Thursday 28 January, the LSE hosted the first hustings event of London’s 2016 Mayoral election. Third year LSE Department of Government undergraduate Barnaby Perkes assesses the debate as Sian Berry, Zac Goldsmith, Sadiq Khan, Caroline Pidgeon and Peter Whittle lock horns over the key issues facing the capital. As the candidates walked on stage to a packed Sheikh Zayed lecture theatre last Thursday, for the first hustings of the 2016 London Mayoral election campaign, there was a palpable sense of tension around the room. The significance of the event seemed to have occurred collectively to the audience in the few minutes before it began, and the unexpected addition of a BBC news team outside the New Academic Building added to the excitement. With introductions from Professor Tony Travers and chair Colin Stanbridge (replacing Tim Donovan, who was now reporting on the event from the outside), the evening took on a sudden prestige, which was reflected in the quality of the overall proceedings. Being a student in London, I (along with everyone else in the room) particularly hoped the candidates would address the ongoing housing crisis facing the capital, and in this regard the hustings was an excellent showing. Zac Goldsmith, the Conservative candidate, opened the addresses with a speech which tied his prospects somewhat to the successes seen under the current mayor, Boris Johnson. He spoke of the need to make London’s recent successes work for everyone and help those priced out of the capital. In this regard, his and Labour candidate Sadiq Khan’s addresses were eerily similar. Indeed, although Khan went to great lengths to implicitly contrast his humble upbringing on a council estate with Goldsmith’s more affluent childhood, the two ‘main candidates’ both focused on the issues of transport, crime, and the environment in their opening speeches. The other candidates’ openers were more diverse. UKIP candidate Peter Whittle’s was the most personal, as he waxed lyrical on being a Londoner born and bred. Whittle also – and to his credit, accurately – predicted he would be the only candidate to talk about the demand side of the housing crisis, and was similarly prophetic when London’s housing problems came up later in the panel-wide debate. The Liberal Democrat candidate, Caroline Pidgeon, was eager to contrast her eight years of City Hall experience with the other candidates, and this manifested itself in some of the strongest policy proposals of the evening. Her address was broad in policy scope, covering not just housing but also childcare, travel fares and air quality. Pidgeon’s high point was a fully costed plan for building 50,000 new homes in London, by converting the Olympic precept into a housing precept. The comprehensiveness of her proposal, which included a new City Hall building society and a construction academy in London to provide jobs and labour for the home-building, suggested a degree of forethought which set her apart from the other candidates without seeming scripted. Her experience in City Hall strongly equipped her for the debate on housing in particular, and her coherence stood out amongst a panel that lacked the edge to match her pointedness in providing firm policy solutions to the problems at hand. Sian Berry’s address as the Green Party candidate offered some of the most novel pledges, including reducing and eventually abolishing fare zones by 2025, to reduce the cost of commuting and make London work possible for commuters on lower wages. Other offerings included a London regional bank for projects specific to the city, and a renter’s union to help tackle high rent in the capital. However, I felt the appeal of her candidacy was somewhat reduced by her proposal to buy and close City Airport with London borough money, to the tune of £2 billion, and build houses on the land. Berry also seemed somewhat diminished as the pro-environment candidate, given the panel’s broadly green credentials, with Goldsmith in particular renowned in that sector for various environmental campaigns. The fact that we saw all candidates sign up to pollution limits in London on the spot, as well as a cross-panel commitment to no building on green belts, meant that at times it felt as if Berry had lost a big part of her unique selling point. Beyond the opening addresses, the flashpoints were somewhat limited. The main one saw Pidgeon, the liveliest of the panellists, dismiss Whittle’s call to leave the EU as “insane”, drawing one of the loudest applauses of the evening. Though Whittle’s self-deprecation and frankness was refreshing, the audience’s broadly negative response to his anti-EU stance was telling. Amongst the two main candidates, their clearest clash came over the affordability of housing. Khan convincingly cast Goldsmith as out of touch with his definition of an affordable house costing £450,000. He may well have a point, given that the implications were an annual salary of £77,000 and a deposit of £98,000 to be able to afford such a property. Khan instead pushed his ‘homes for Londoners’ scheme which guaranteed half of all new housing to go to London buyers, echoing Whittle’s call to prioritise Londoners (defined as those living in London for at least 5 years) in the housing crisis. When he re-addressed this criticism later on, Goldsmith made valid distinctions between social and market housing, noting in particular the unavailability of either for young professionals in London’s current state. Yet the moment had passed, and Goldsmith generally seemed a little too reserved and not eager enough for the mayoralty. Khan was more forward and affable, though was overshadowed by both Pidgeon and Whittle in that regard, the latter winning a warm round of applause when he stated his wish to be the “first gay mayor”. Pidgeon also seemed to best understand the variety of issues at hand for voters: whilst clear and strong on housing, she also had proposals for childcare and acknowledged the poor levels of post-pregnancy employment, demonstrating more than mere lip service to family issues. Berry was amiable enough and was convincing on crime prevention needing to become a priority over crime prosecution, but the pro-environment panel stole some of her ideological thunder and the City Airport proposal just seemed too far-fetched for both the audience and the panel. For the two main candidates, then, little new ground was broken; yet Khan did noticeable damage to Goldsmith on housing affordability, and seemed hungrier for the role. Goldsmith’s somewhat withdrawn, passive approach may have been intended as authoritative, but it instead came across as distant and risked indifference. Whittle charmed at times but was not particularly strong on policy, nor did his anti-EU stance seem popular with the audience (though whether that is representative of London’s views as a whole is yet to be seen). Pidgeon was strongest on policy, with her fully costed housing policy outshining Khan’s rhetoric and Berry’s City Airport proposal, which (unduly or otherwise) damaged her credibility in the debate. Beyond housing, the key issues seemed to be family-oriented, with questions on the environment and education featuring prominently. Though only the first of many, this hustings event bore the promise of a terrific mayoral contest in the run up to May’s election. In particular, the candidates’ dynamic was combative and engaging enough to maintain interest and stir reaction, and if the strong performance of the bolder Pidgeon and Khan is anything to go by, this will only improve with time. Barnaby Perkes is a third year undergraduate in BSc Government and History in the LSE Department of Government. 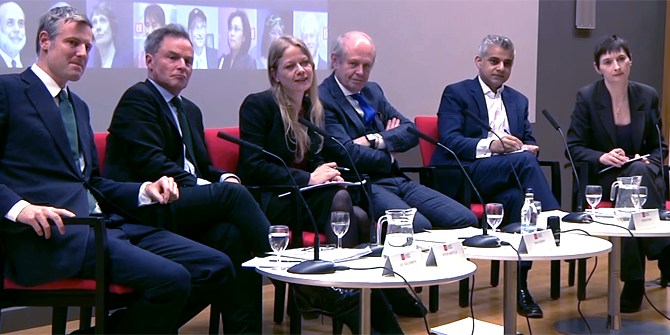 This hustings event was arranged by London Tomorrow, and hosted by LSE London at the LSE – a full video and podcast of the event is now available. Visit LSE Events to find out about all the LSE’s upcoming public events. Note: this article gives the views of the author, and not the position of the Department of Government, nor of the London School of Economics.